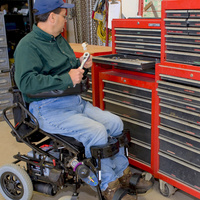 AgrAbility is a USDA-sponsored program that assists farmers, ranchers, and other agricultural workers with disabilities. While the term "disability" often brings to mind conditions such as spinal cord injuries and amputations, AgrAbility addresses not only these but also many other conditions, such as arthritis, back impairments, and behavioral health issues. Why does the program have two names? Purdue University began serving farmers with disabilities in 1979, and the program became known as Breaking New Ground. Later, in 1990, Congress created the AgrAbility Program, and Breaking New Ground received the grant to lead the Indiana AgrAbility Project. Therefore, since some people know the program as Breaking New Ground and others as AgrAbility, both names are used.